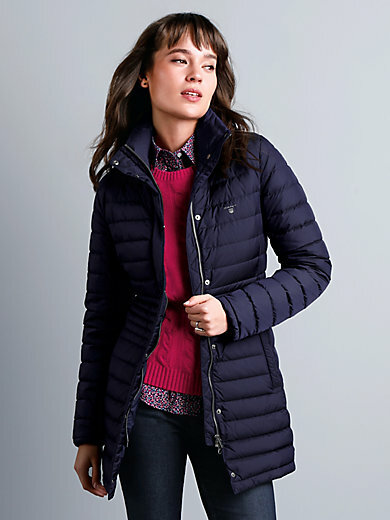 Quilted down jacket by GANT with integrated hood. As soft as down, feather-light and utterly trendy. Elegant sportswear in GANT-style with logo on the front − simply perfect for winter-warm, everyday outfits. Made of elegantly iridescent, horizontally quilted microfibre with a great filling of 90% down, 10% feathers. Special parts at the waist create an attractive silhouette. With high-closing stand-up collar, press stud front and concealed 2-way zip fastener. 2 seam pockets with press stud fastening and an inside mobile phone pocket with press stud. Outer fabric and the lining are made of 100% nylon. Length approx. 31ins. The quilted down jacket is machine washable.